Laundry capacity can be increased three times, using the same amount of fresh water, by recycling the wash and rinse water. Reclaimed wash and rinse water saves the cost of purchasing water, soap, heat and sewer. Reclaim your water for $1.70 per thousand gallons. Customer acceptance and peace of mind is assured by using city water for the final rinse. The added volume of water is needed to make up for the water evaporated when the laundry is dried. The washing machines can be plumbed to use recycled water for the wash and rinse cycles, with the exception of the final rinse, which would be fresh city water. Water quality is assured by automate electronic monitoring for turbidity and disinfectant. The water is screened, electrocoagulated, clarified and stored for use on demand in an ozonous clean water tank. A turbidity and ozone probe monitor the quality of the reclaimed water continually. The vacuum clarifier concentrates the solids to 20% by weight allowing them to be disposed of in the dumpster with the lint and paper trash. The cost of wash and rinse water disposal and the possibility of fines for contaminants in the water going to the city sewer are eliminated because there is not discharge to the city sewer. The heavy metals, oil, and grease are separated from the water during the reclamation process in an environmentally safe oxide form. Ultra pure potable water can be produced from salt water without reverse osmosis brine water pollution, using vapor recompression distillation. Vapor recompression distillation allows you to produce ultra pure water and marketable salt, without producing any harmful by products for the environment. Ultra pure potable water can be produced from salt water without reverse osmosis brine water pollution, using vapor recompression distillation for 0.15 KW per gallon of water produced. The sodium chloride is concentrated to a marketable concentration between 20 and 50% solids. This eliminates the reject stream of concentrated brine from reveres osmosis units that kill the wild life, plants, and fish in the discharge bays. Traditional reverse osmosis desalination technology rejects up to 70% of the incoming saltwater stream. The salt concentrated rejected water is usually placed back into the bay or incoming water source, killing the plant and animal life with excess salt concentration. With vapor recompression distillation the salt is removed in a solid form between 20 and 50%. The salt can be packaged and sold for animal feed, water softeners, road de icing, etc or the concentrated salt can easily be shipped out to sea where the concentrated salt will not harm the coastal wildlife. Because vapor recompression distillation reused much of the input energy, the process produces a gallon of ultra pure distilled water for 0.15 KW of electricity per gallon or one cent per gallon with electricity costs at $0.07 per KWH. Water contaminated by flood, fire, earthquake, tornado, sewage, pesticides, heavy metals, and bacteria can be cleaned in a 1.5 or 3-gpm portable unit. The units are small and light allowing them to be carried in a jeep or pickup and operate off of a single phase 110 or 220-volt generator. The self-priming pump feeds water into a skid mounted electrocoagulation system followed by a self-cleaning 0.2-micron ceramic filter. Electrocoagulation causes bacteria, pesticides, heavy metals, and silt (suspended solids) to increase in size, making them removable in the 0.2-micron ceramic filter, insuring clean drinking water. Meat, Poultry, Fish, total plant effluent to harvest additional protein and fat for sale, Salad oil, beverage, potato processing, vegetable washing, equipment washing. Electrocoagulation causes a wide range impurities to become separable from your drinking water. View the below .pdf for some examples of the effectiveness of electrocoagulation used in a potable water application. Steam cleaners are used in many industrial applications to clean parts and equipment. Some major users of steam cleaning equipment include truck and bus washing, engine cleaning, and all types of repair facilities. Treating the waste streams generated from steam cleaner units operating in California has proven effective in separating the oil and water and removing metals and dirt from the water so the water can be reused. 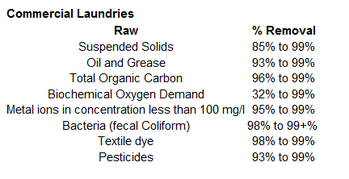 One example is the waste water from a steam cleaner used to clean oil field service equipment which contains 8 ppm of chrome, lead, and zinc with lesser amounts of the other 17 metals on the states standard test along with a few ppm of oil and grease. At these concentrations the water is considered a hazardous waste with disposal costs ranging from $0.60 to $2.30 per gallon. After treatment by electrocoagulation, the clear water met all federal secondary drinking water standards with the exception of surfactants. This was not a concern because the water was recycled through the steam cleaner and the recycled surfactants reduced the need to add soap to the steam cleaner system. It should be noted that charcoal could be used in conjunction with the EC process to make the water meet secondary drinking water standards. 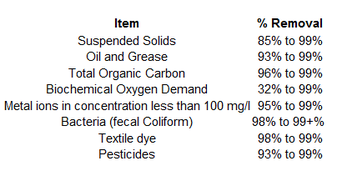 The sludge from the EC process contained 90 mg/kg oil and grease. The heavy metals were converted into oxides and the sludge passed the states TTLC and STLC as required by CAC title 22. As a result the State Health Board approved the EC processed sludge as a non hazardous waste. View the .pdf below to further explore the effectiveness of electrocoagulation in steam cleaning applications. Metal ion isotope removal from cooling water at a nuclear power plant site demonstrates another effective application of electrocoagulation. Electrocoagulation has proven effective in treating sewage water, sewage sludge concentrations, and sewage sludge metal fixation sufficiently to enable land application. View the .pdf below to get specifics on how electrocoagulation can treat sewage water. Why risk EPA fines and prison terms when you can convert the heavy metal ions in your plating rinse water stream into marketable metal oxides. The metal oxides are hydrophobic and dewater well. Metal oxides can be sold as raw components for new products. This eliminates the long-term liability associated with metal hydroxides. The metal oxides dewater 76% easier, creates 83% less sludge volume, and is 88% less expensive than chemical coagulation. The separated rinse may be reused. With no water discharge, there is no potential liability; you save on sewer cost, monitoring, and testing fees, as well as the cost of make-up water. The removal of 90%± metals is sufficient reduction to achieve quality-plating results. Metal platers use electrocoagulation to remove metals from the plating rinse water tank, enabling them to reuse the remediated water as process water. With no water discharge, they avoid potential liability, save on sewer cost, monitoring, and testing fees, as well as the cost of make-up water. 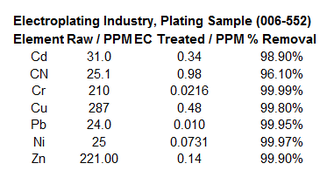 The removal of 90%± metals is sufficient reduction to achieve quality plating results. Dyes are successfully removed from the water through the use of Electro-Coagulation.